Maybe you remember the commencement speaker from your college graduation; maybe you don’t. 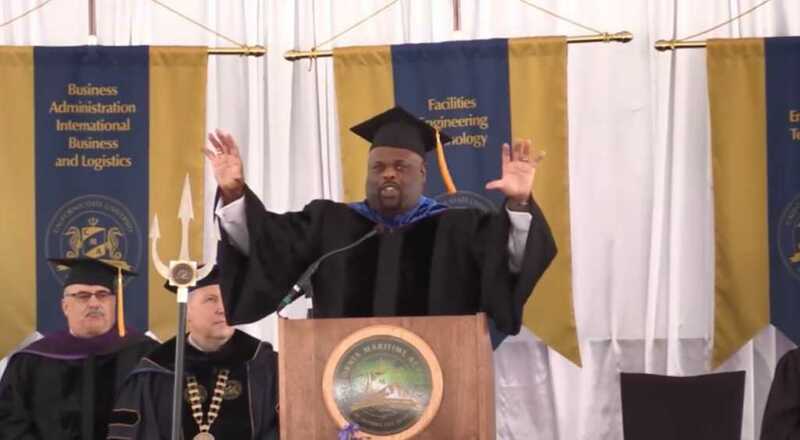 But it is safe to say the spring 2017 graduates of the California State University Maritime Academy will never forget the wisdom award-winning journalist, author, and—most importantly—son of a ship’s cook Dr. Rick Rigsby shared with them on their graduation day. “It’s not oxymoronic for me to say the wisest man I ever met was a third grade drop out,” Rigsby said while introducing the audience to his late dad—a man that had to stop going to school in third grade in order to help out on the family farm but never allowed his lack of education to keep him from learning. “Don’t ever forget that,” he declared. Rigsby said that he was not concerned about the likelihood of success for any of those gathered before him. Instead, he was “worried” that the graduates wouldn’t “fail from time to time.” He believes that it is through failure that true success is born. In closing, Rigsby shared the deeply personal story of his late wife’s, Trina Williams, passing, which be believes was the darkest time of his life. He credits his faith in God and two sons for helping him press on, but he believes it was three simple words his father said to him as they laid Trina to rest that reminded him of the reason for living. One day, Trina finds a lump in her left breast. Breast cancer. Six years after that diagnosis, me and my two boys walked up to mommy’s casket. For two years, my heart didn’t beat. If it wasn’t for my faith in God, I wouldn’t be standing here today. If it weren’t for those two little boys, there would have been no reason for which to go on. I was completely lost. That was rock bottom. You know what sustained me? The wisdom of a third grade dropout. The wisdom of a simple cook. We’re at the casket. I’d never seen my dad cry… [but] my father shared three words with me that changed my life right there at the casket. It would be the last lesson he would ever teach me. He said, ‘Son, just stand.’ You keep standing. No matter how rough the sea, you keep standing. and I’m not talking about just water… No matter what, you don’t give up. Just as Rigsby’s father never let his lack of a formal education get in the way of his learning, he concluded by encouraging the graduates to never take their knowledge or opportunity for granted.